Judge Slocum was a member of the SJS (Special Judicial Squad: Justice Department internal affairs) under the then head of the SJS, Judge Cal. When Cal took over the Department he used the SJS as his personal retinue. Slocum had qualms about how Cal behaved and eventually ended up aiding the resistance. But being a Judge, Judge Slocum should have never left things get that far in the first place. Therefore his ridiculous end at the hands of the by then totally off the rails Chief Judge Cal was somewhat deserved. Of note here is some scale comparison between Slocum and the Mongoose SJS figure that I painted up a little while ago. The Mongoose SJS figure is the shortest Mongoose Judge that I own. Slocum on the other hand is a tall figure from a different, slightly larger range which also gains another couple of millimetres from its integral base. The end result is that the height (and to some extent the proportions) are compared at extremes in this case. The differences between the two bother me only minimally. When stood together Usual Suspects style the differences are as apparent as they can be and yet are still within acceptable parameters for me. Spread out on the tabletop there is essentially no discernible difference. I actually like elements of the size difference, as the pair of SJS Judges remind me of various duos from crappy buddy cop movies, “Ponch” and “Jon” from CHiPs and “URL” and “Smitty” from Futurama. The gun is the difference which hurt my eye! But a solid paint job yet again. Soon you will have to get a group shot mate! An up to date group shot is coming. 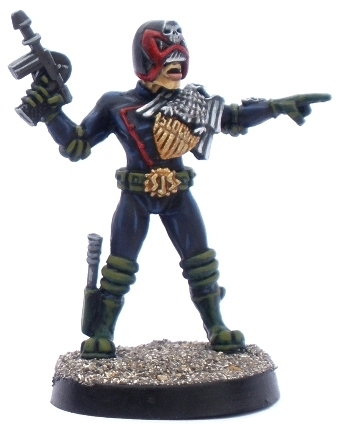 Still loads more Judges to paint though. I used to prefer the more modern look of the Lawgiver MK II, but I have warmed to the original a little again recently (I am assuming that its the design of the gun rather than the painting that bothers you 😉 ). The MK I is very distinctive, ridiculous and very sci-fi looking, whereas the MK II looks a bit generic, like every other big sci-fi pistol around these days. I am happy enough with either really. Hehe… Yes it was the design of the gun. Maybe it grows on you, or I may have the GW syndrome…Bigger guns!